This Sunday, February 5, at 11:00 am, the Archbishop of Detroit will install the new Pastor of St. Joseph Oratory, located at 1828 Jay Street in Detroit. The installation in the Extraordinary Form reveals all the essential duties of a pastor: to offer Mass and distribute Holy Communion; to bring people to the church, baptize, and absolve them; and to preach the Gospel. During the ceremony, the new pastor makes a profession of faith and oath of fidelity. 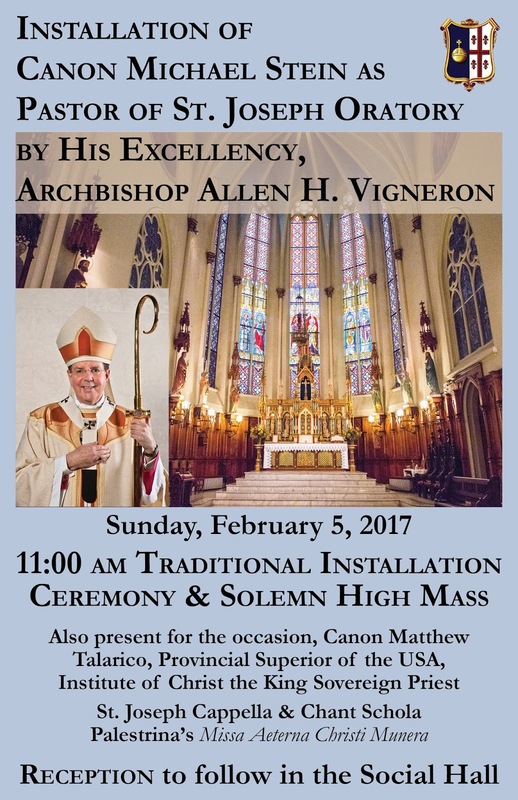 The archbishop imposes the pastoral stole on him, and leads him to ring the bells, to open and close the Tabernacle, the front door of the church, and the baptismal font, to enter the confessional, and to ascend the high pulpit. The ceremony also includes prayers from the feast of the church’s patron, in this case, St. Joseph, Spouse of the Blessed Virgin Mary.